It's Oscar night! Tonight is one of my favorite nights ever. Really though, since I was little I used to get very excited to see the Academy Awards. Of course, that's not to say that I was actually allowed to see them in full; either my curfew or my intolerance for long speeches would turn me away from the screen before the Best Picture award was handed out. But not tonight. Tonight I get to see the whole thing--and I'm very excited about it. My TV has been on since six p.m., I haven't been paying attention the whole time (I do have a life you know), but still, it's been on. I was watching the Red Carpet coverage while making and eating dinner--which by the way turned out to be delicious. Now I'm sitting here, after putting off finishing my work, and I'm enjoying every moment of it. Except for the speeches, that's what my laptop is here for. Let's talk food. I went to Trader Joe's today to buy two things: oranges and greek yogurt. Instead, I left with a bag that almost too heavy for me to carry home. Needless to say, I had plenty of ingredients to make a yummy dish for dinner. 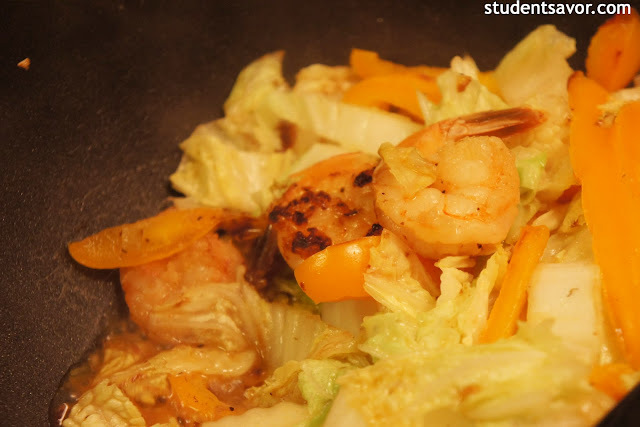 I chose a simple shrimp and cabbage stir fry and spruced it up with a leftover bell pepper (my current obsession). It was actually very good. Crisp, juicy, fresh and flavorful. Enjoy! 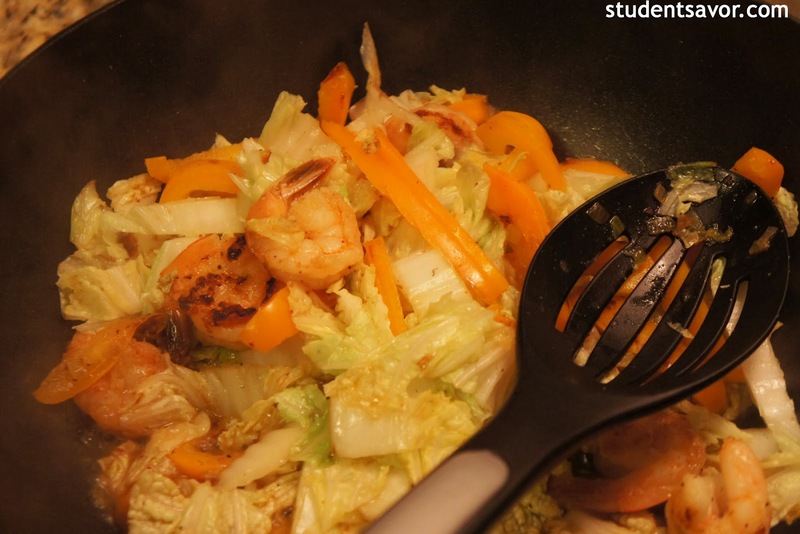 In a small bowl, combine egg white, 1 tablespoon cornstarch and 1 teaspoon soy sauce, and stir until frothy. 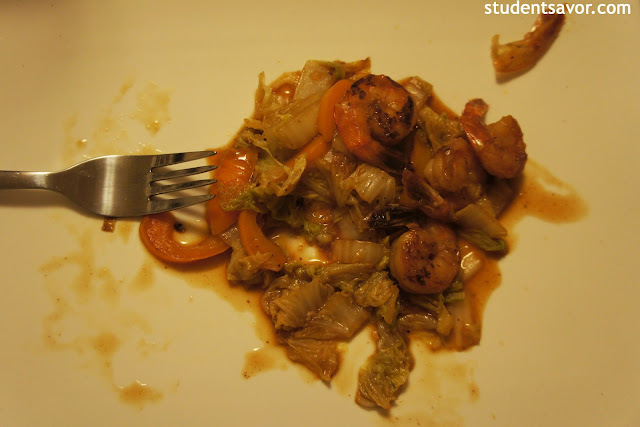 Place shrimp in a Ziploc bag and add marinade. Refrigerate for about 10 minutes. Meanwhile, in another bowl, whisk remaining cornstarch and soy sauce with rice vinegar and hoisin sauce. Add chicken broth and set aside. 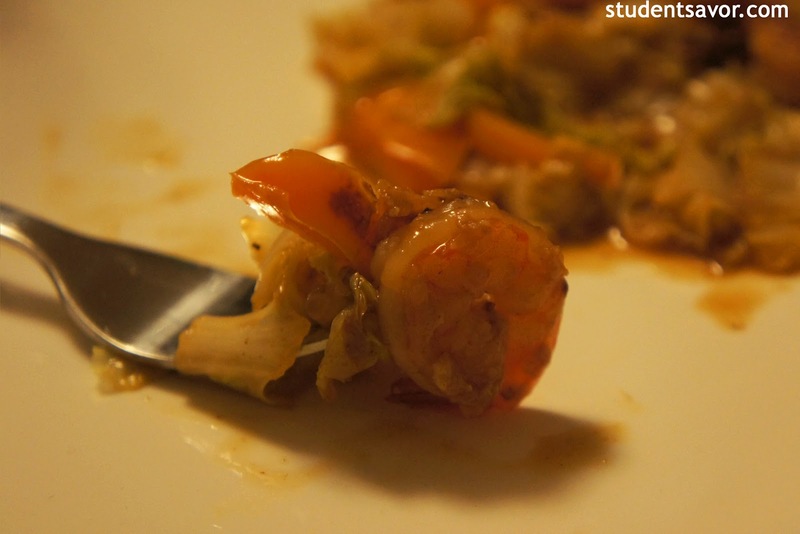 Drain shrimp and set aside. Heat oil in a wok over medium-high heat. Add shallot, bell pepper and ginger and stir-fry for about 2 minutes. Add shrimp and cook until almost cooked through, about 3 minutes. 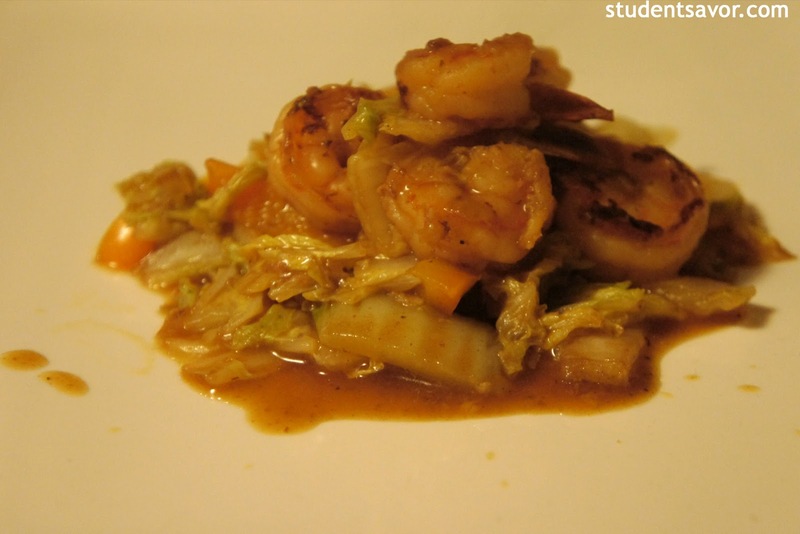 Add cabbage and continue cooking until cabbage is wilted and shrimp is cooked through, about 2 more minutes. Stir in hoisin sauce mixture and simmer, stirring occasionally, for about 2 minutes. Serve over rice or udon noodles if desired.